I had waited eagerly for spring in Portland, but it snowed the day before I left for San Diego. The next day, I went from winter to summer in the space of a few hours. The black jacket I that had accompanied me all winter was suddenly to warm and gave away I was not a local. The first person I got to meet in San Diego was Zander Keig, who is the editor of Manning Up and Letters for My Bothers, and wrote a review for my book, Life Beyond My Body: A Transgender Journey to Manhood in China. Since Zander learned about me two years ago, he has been supportive in every way he could: networking, finding resources, and funding, and spreading the word about my book. 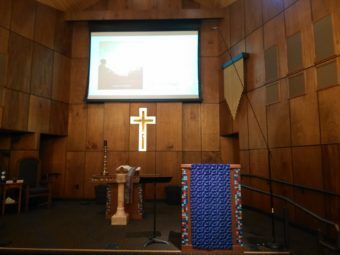 It was he who set up the author event at Kensington Community Church in San Diego, so I got an opportunity to visit. His kindness without expectation of repayment has never failed to move me. On March 7th, Zander pulled up at the airport in his gray Honda, got out, and we finally met in person. He gave me a brief tour before he driving me to my accommodations. Zander pointed out the marine military base, the Spanish architectures with arches, how close the airplanes flew over the houses, and how the moon, like a white veil, appeared in the sky in broad daylight. I lodged with a host, Carol, a lady in her sixties, I guess. She has a small house in her backyard, which she dearly called “Casita” in Spanish. She would not rent it, she said, but she keeps it specially for receiving guests — guests like me, who she had never met before. 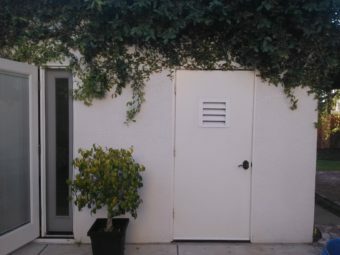 Casita is white and rectangular with its roof and half of its walls covered by vines and leaves, which were like a green wig. The interior is like the ones in magazine pictures, with everything exquisite and artistic. In my eyes, Carol is rich in a real sense, not because of what she owns, but what she gives. I believe she also has a great treasury in heaven. Carol stored food and drinks for me in the refrigerator, telling me repeatedly to make sure I got all I needed, then she handed me the key and left me privacy. There was a globe in the Casita. As I spun it and looked for where I was, I was amazed to consider how I had crossed the vast Pacific, an intimidating distance. It was a good metaphor, I thought. Reaching the other side of the water was like reaching the other shore of my former situation. I had crossed what seemed impossible, from living in stealth to living openly; from fear of rejection to making a good confession; from being restless to having found peace. Carol prepared a delicate dinner, and invited Pastor Darryl, her neighbor Janet, and Zander. From what they said, it seemed they had big expectations of my speaking. Pastor Darryl decided to have me speak in the magnificent sanctuary instead of the fellowship hall. I felt pressured and feared I would be a disappointment. It turned out I received a lot of applause, handshakes, and good wishes after my presentation the next evening, which had become one of my most beautiful memories and made me sleepless that night. Looking back at some of my experiences: working at a school where I was trained to tell stories to the kids; doing translations, which improved my English greatly; and being given a few opportunities to share messages in my church, I realized probably God had been preparing me for this moment. As new wine must be poured into new wineskins, I must be renewed to take on new things. Otherwise, I might be too nervous to speak. Such a venue and such expectation, could have crushed me. Knowing it was video recorded, made me conscious of my hands and where I should put them, so I looked clumsy. As a perfectionist, I wished I could speak better and look better. But I learned speaking is not about performance, it’s about communication. Be true and do your best, there shall be nothing to regret. Next I will be speaking at Q Center in Portland, June 9th, starting at 7 p.m. I hope you can join me to hear me read from Life Beyond My Body and get your copy signed.